Puerh, I'm looking at you! William's first visit was too short (a whole afternoon! ), so we scheduled another meeting last Friday. William isn't just blogging and selling puerh, he's practically engaged to the daughter of a Jingmai tea farmer, and aims to become a ea farmer himself! That's why he's studying agriculture in Taiwan right now. 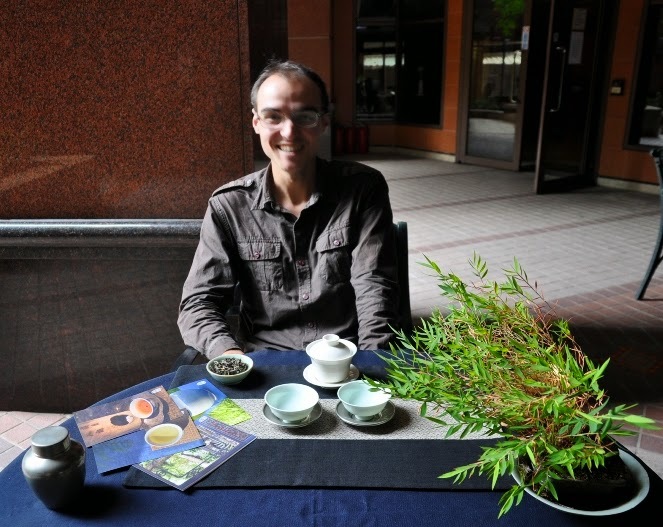 He has already a lot of experience tasting fresh teas from various tea regions in Yunnan (and beyond). 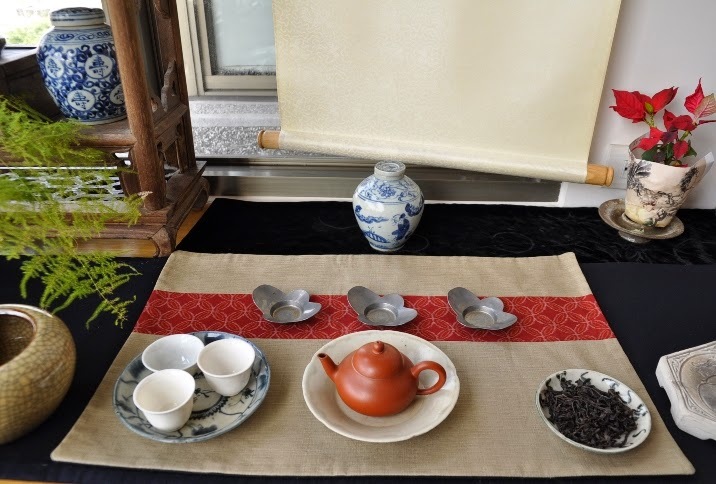 So after Oolong last week, I proposed, and he accepted, a class about aged puerh. 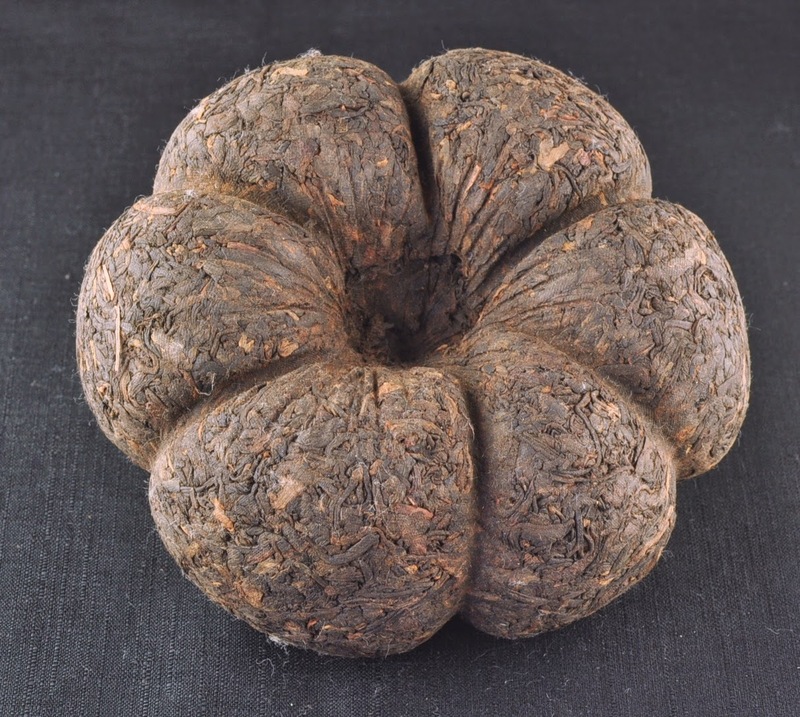 The aging potential of puerh has done wonders to the fame and reputation of this type of tea. 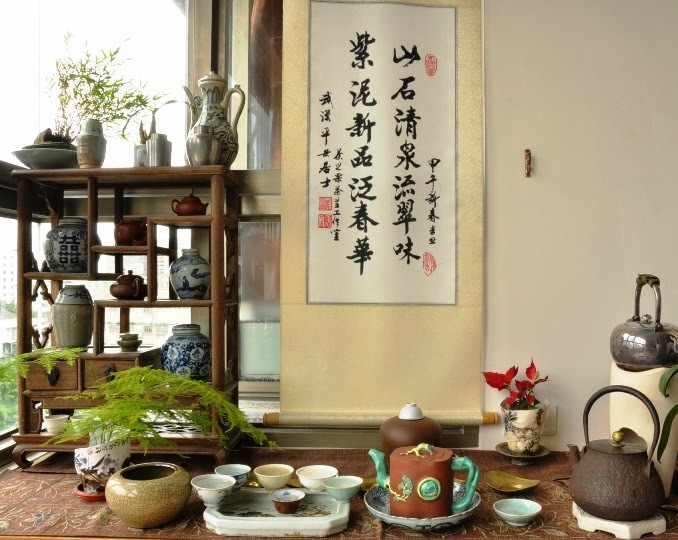 The auction records for old cakes of TongQing Hao, Song Pin Hao... have attracted the attention and money of new investors, famous writers (like Yu Qiu Yu, 余秋雨) and rich tea drinkers in China. 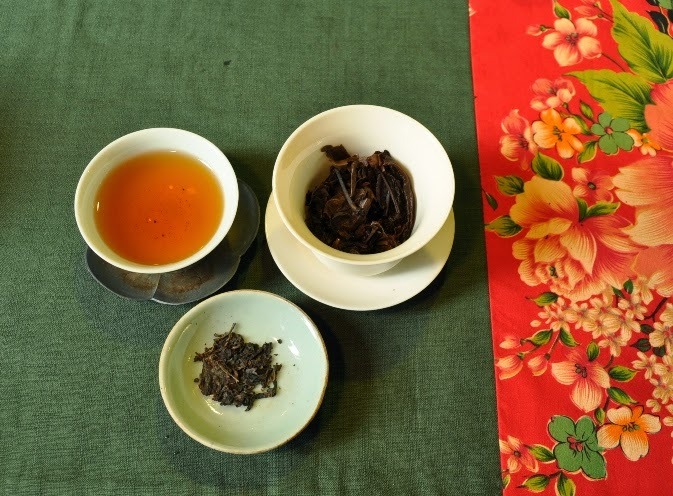 William confirms that Yunnan is quickly changing and modernizing thanks to the wealth created from high quality, old arbor and wild puerh leaves. 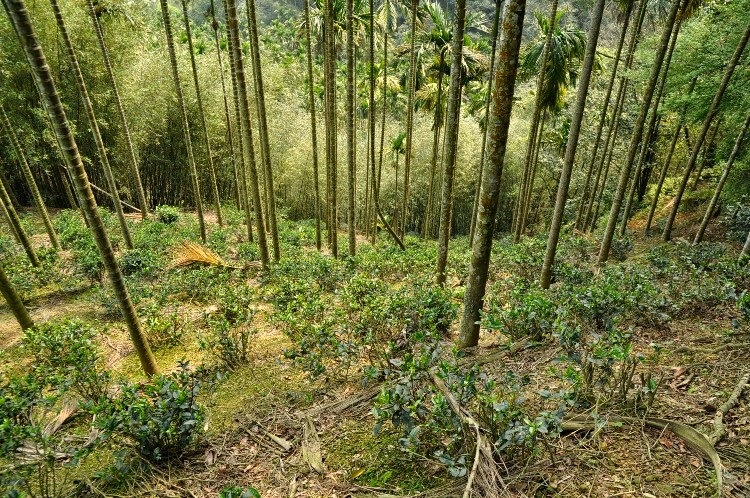 Taidi, plantation puerh, is stagnating or is even being replaced by other cultivations. 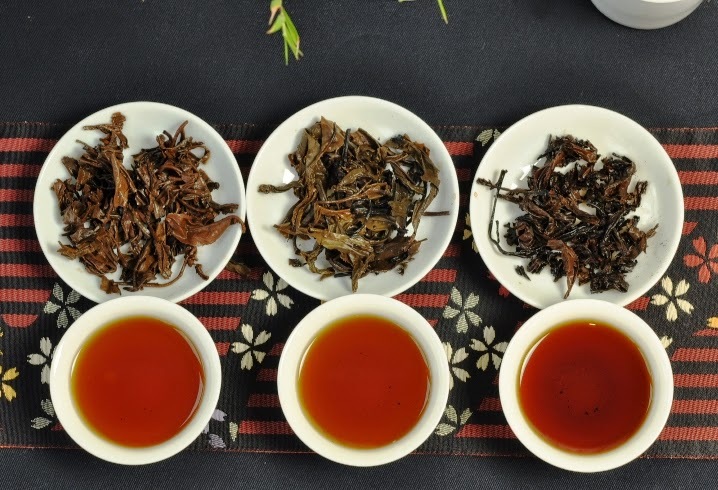 A big reason for this focus on quality is, I think, that puerh drinkers understand more and more clearly that it's only the best leaves that age well. 3 different aged puerhs. Can you tell the difference? 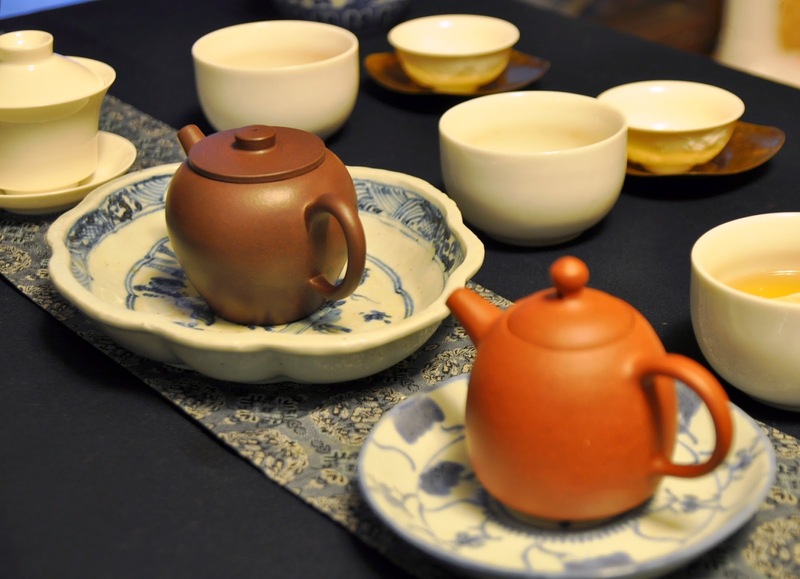 But there's still confusion about old puerh. High prices have also increased the number of fakes. 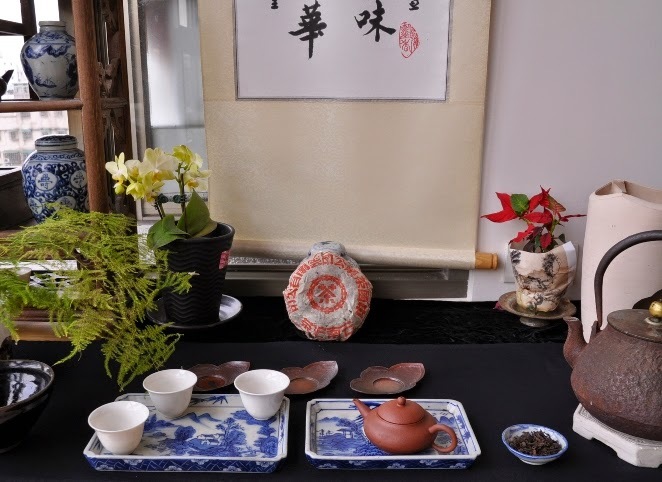 So, this class' purpose is to teach William how to identify 3 types of aged puerh. But instead of looking at wrappers, which can be easily forged, I taught him to look, smell and taste the leaves. 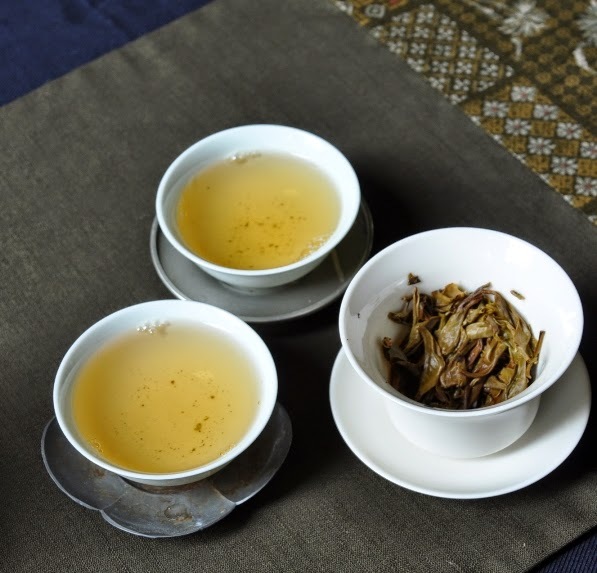 We brewed the leaves in a gaiwan, using a similar amount of leaves and time. The next 3 pictures show that the color of the brew was quite similar. What changed the most were the scents and taste. 1. The fake: a mid 2000s mix of sheng and shu leaves. 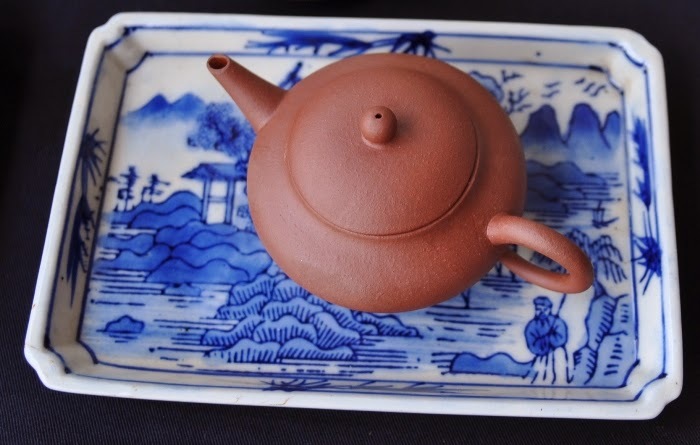 (It is sold as a mid 80s aged puerh.) It's already 10 years old now and starts to be aged now. 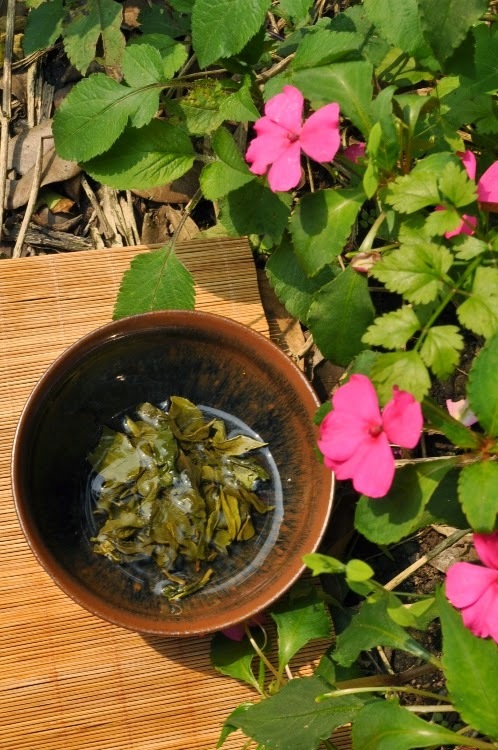 It's interesting to see how this mix of leaves combines the energy of sheng and the sweetness of shu. The color of the brew is just slightly darker than the other puerhs. 2. The 1999 Menghai Tea Factory '7542'. 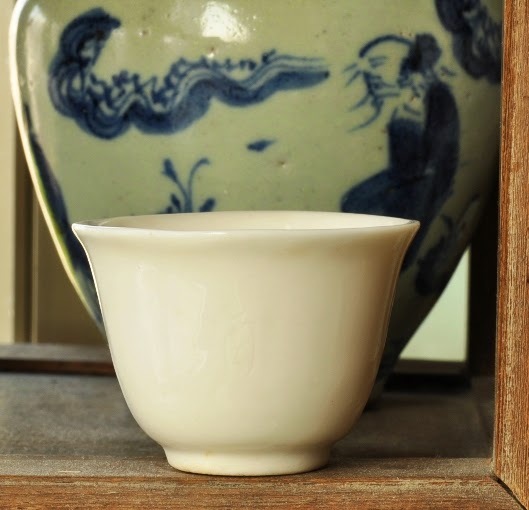 This classic raw puerh has a scent of humid storage. This type of storage develops storage smells that we typically associate with old puerh. Some people like this smell very much. Others will choose to air such leaves before brewing them (I belong more to this group). What's important is to feel the level of energy in the taste to conclude that it's raw. 3. The mid 80s raw, unblended, loose puerh. These leaves were stored in a drier environment and the open leaves look still quite young. But the color of the brew is more brown. And while it still has a wonderful energy, it feels somewhat more mellow and rounder in a subtle way. It feels this tea still has lots of potential to improve (while the first felt more limited). 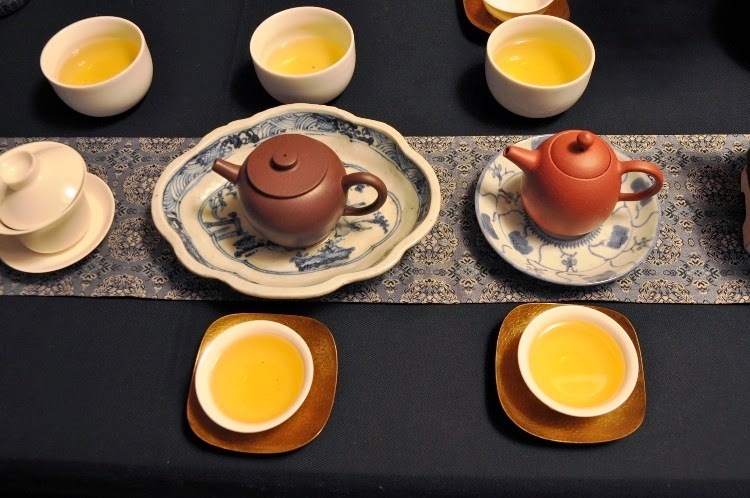 This comparative tasting is a good way to learn about the differences in age, in storage and the risk of fake aged puerh. 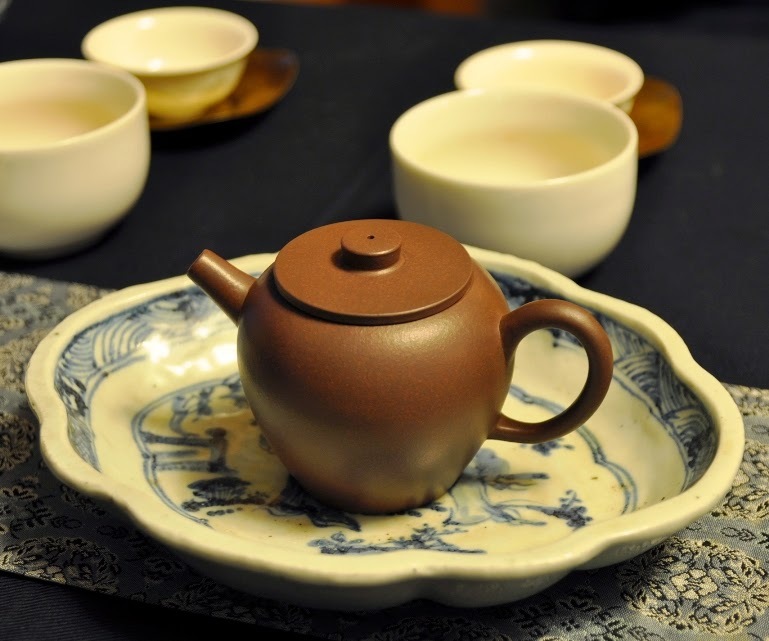 Slowly aged puerh has a pure and light energy (chaqi) that provides a unique experience. 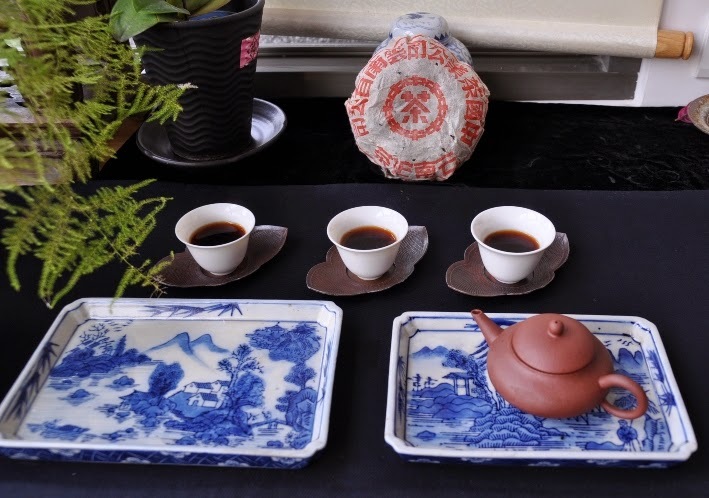 So, I have creaed a sampler of these 3 puerhs so that you may also learn to identify what's the taste and scent of genuine old raw puerh. 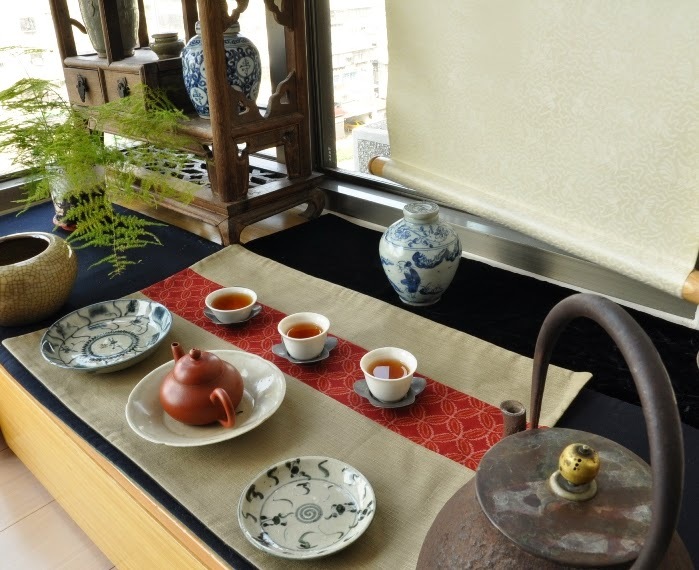 Such teas can also be used as benchmarks to evaluate other old puerhs. On the left is a tea menu from a breakfast place near State College, PA. 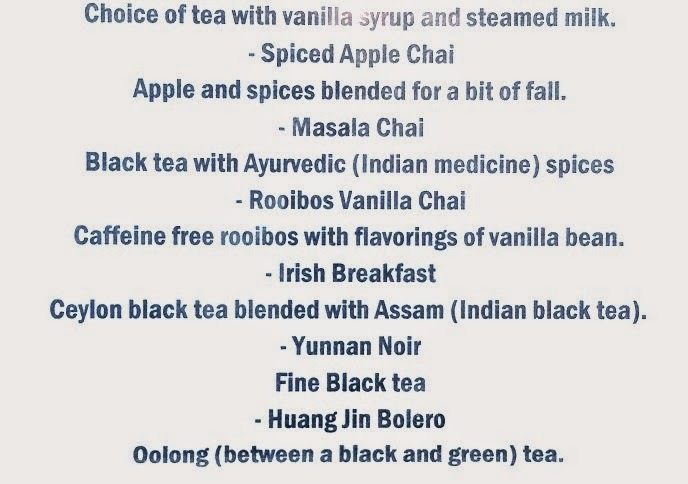 It includes "Oolong" on the very last line, which probably means it's the least ordered tea there. 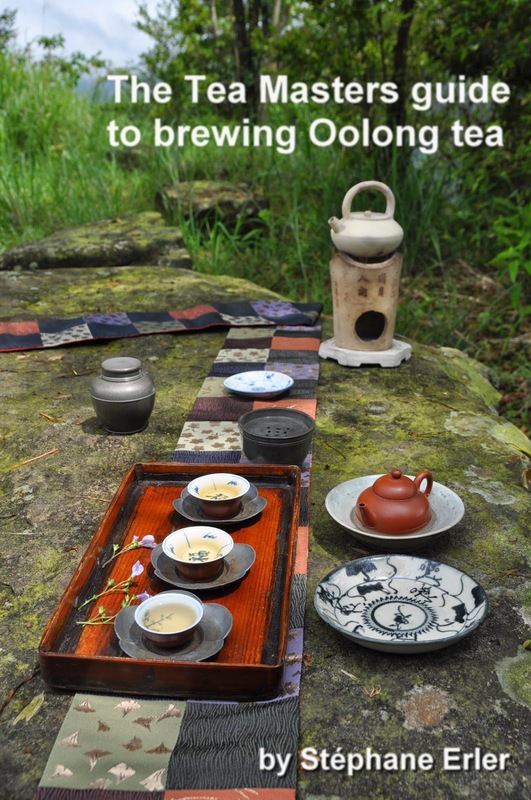 They even provide a broad definition : "between a black and a green" to explain what an Oolong is, which again tells us that people are much less familiar with it than with spiced apple chai! This definition is actually correct (where the english 'black' is the translation of Hong, red), but it's quite vague to describe a particular Oolong. Is it closer to black or green? Or, a more accurate way to ask would be: what is its degree of oxidation? 1. 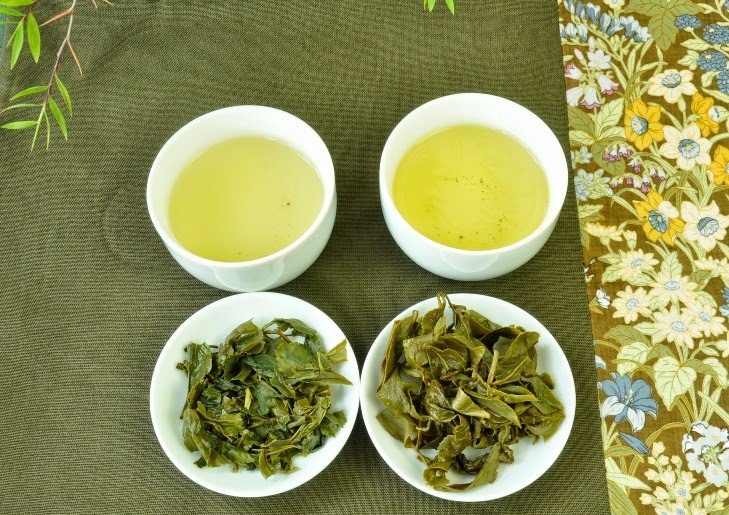 On the left: Jinxuan leaves from March 10, 2015 from San Hsia (Taiwan) processed as green tea (Bi Luo Chun). 2. 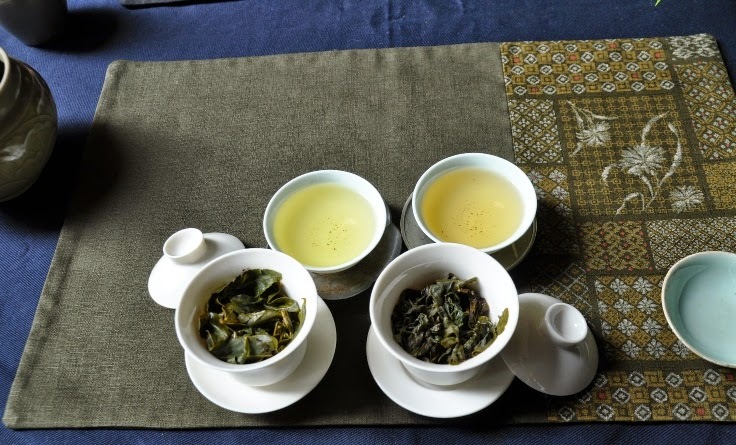 On the right: Jinxuan leaves from December 28th, 2014 from Zhushan processed as Dong Pian, the least oxidized Oolong. The colors are not quite the same, but the biggest difference comes from the aromas. 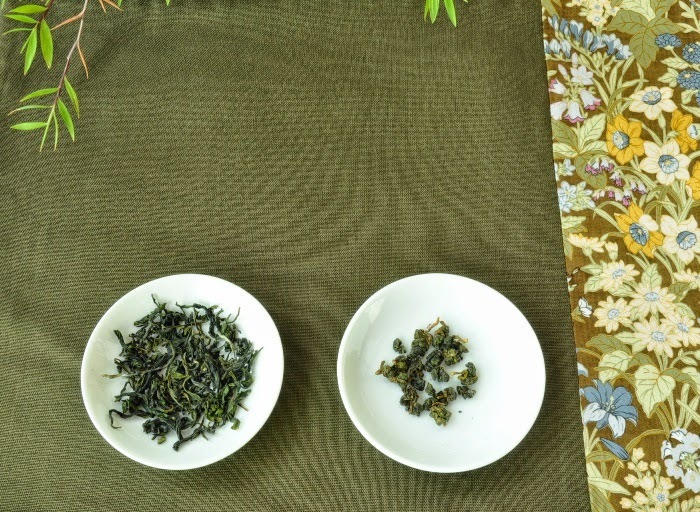 Unoxidized Jinxuan smells more natural, while the Oolong has an added flowery scent from the light oxidation. Thanks to having the same cultivar, it's really possible to isolate this new scent coming from the oxidation and also experience what raw Jinxuan smells like. 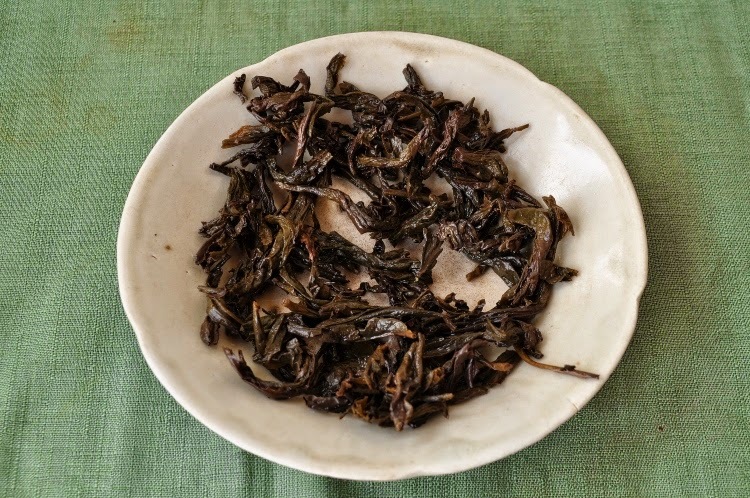 Note: The Tea Mastes online Boutique is now giving away 25 gr of Spring 2014 Jinxuan Oolong from Zhushan for any order of 60 USD or more (not including transportation). It's still free airmail shipping above 100 USD and free EMS shipping above 200 USD. It's officially spring now! The best way to make sure you're getting high quality, early spring tea is to order it now, before the QingMing Festival (April 5th)! La production de théières à Yixing date de la dynastie Ming (1368-1644). La pièce ci-dessus en est un bel exemple. Sa taille est plus grande que la plupart des théières Yixing contemporaines. Pourquoi? L'explication est logique, mais nécessite qu'on se rappelle quel genre de thé on buvait en Chine durant l'époque Ming. Il s'agit de thé vert en vrac. 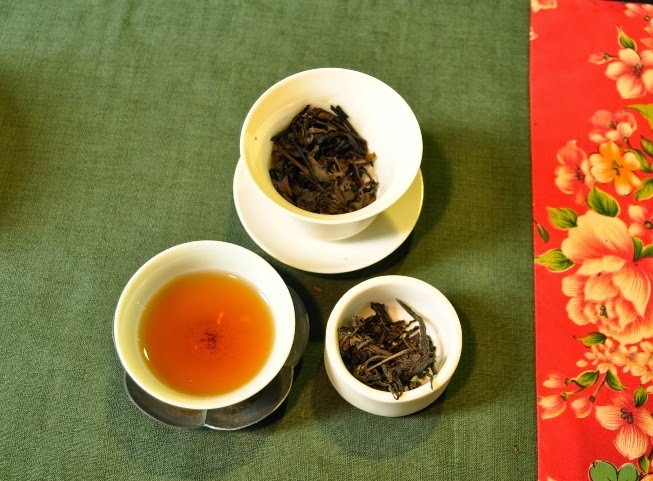 (Le thé vert en poudre fut aboli au début de la dynastie, et les thés Oolongs, rouges et puerhs ne sont pas encore inventés). Les théières étaient grandes, car c'est une famiile de thé qu'on infuse léger. 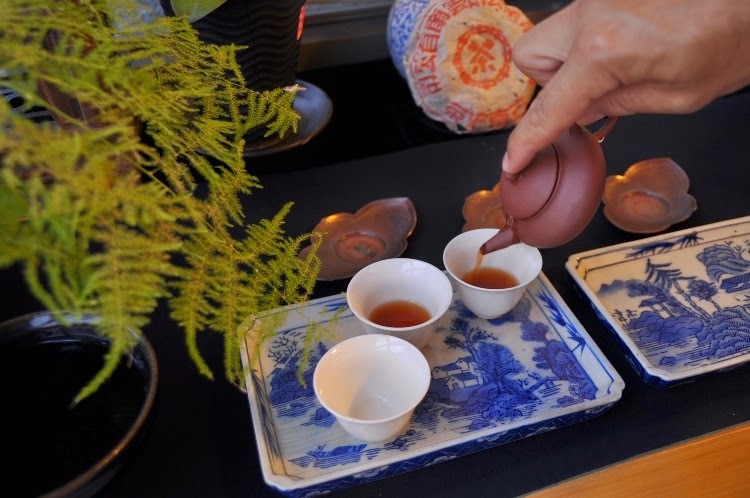 Or, s'il est un principe que beaucoup d'amateurs de thé et de théières Yixing connaissent, c'est que les Yixing ne conviennent pas au thé vert! 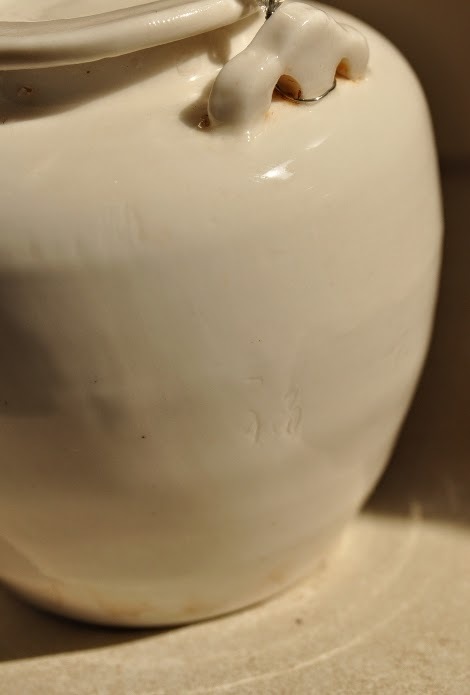 Mieux vaut infuser le thé vert dans une théière en argent (pour les meilleures feuilles), en porcelaine, voire même en verre, dit-on de nos jours. Alors, les anciens avaient-ils tout faux? Sans remonter jusqu'à la période Ming, j'ai récemment pu tester cette Yixing zisha du début de la période de la République de Chine (1911-1935). Il s'agit du modèle Ju Lun Zhu, un design au bouton plat et large sur le couvercle et au bec court et droit. La demande pour une telle forme provenait du Japon, et les potiers d'Yixing y exportèrent de nombreuses théières de ce style. 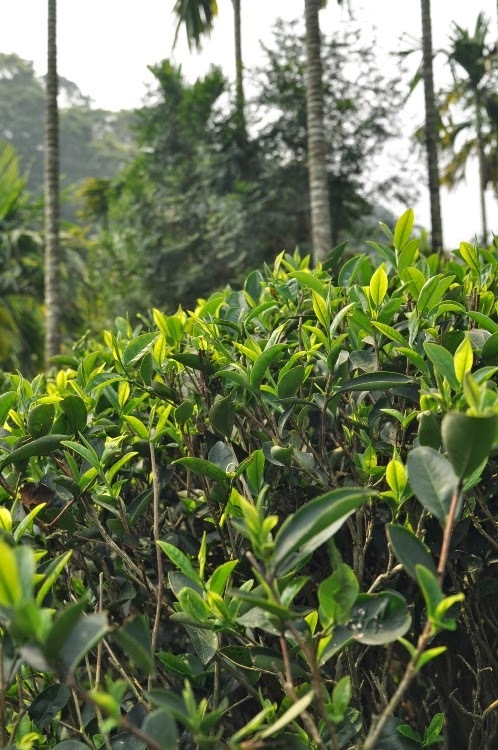 On les y utilisait notamment pour le sencha, le thé vert étuvé! Cela me donna l'envie de la tester avec ce sencha de Hon.yama, récolté fin mai/début juin 2014 (j'en profite pour saluer Florent et le travail remarquable qu'il fait concernant les thés du Japon.) 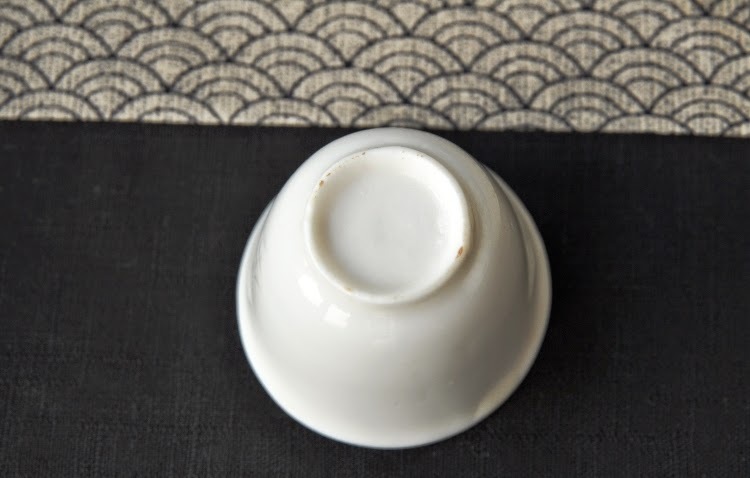 Je l'infuse en gaiwan en porcelaine en parallèle pour mieux comparer. C'est un thé avec une très bonne longueur en bouche. 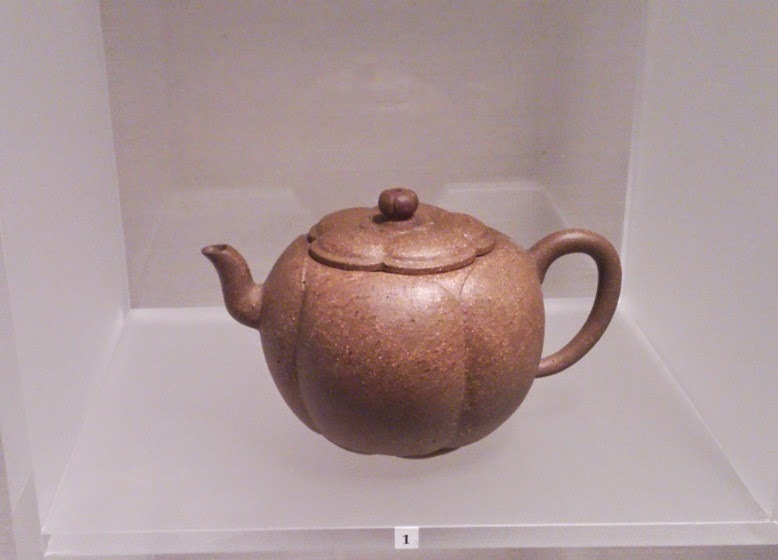 Infusé en porcelaine, il a moins de relief et de finesse que dans la Ju Lun Zhu. La glaise zisha de cette ancienne théière, complètement pure, de cette époque, apporte un plus gustatif même au thé vert! Ce test confirme la raison de la popularité de ces Yixing au Japon à cette époque. 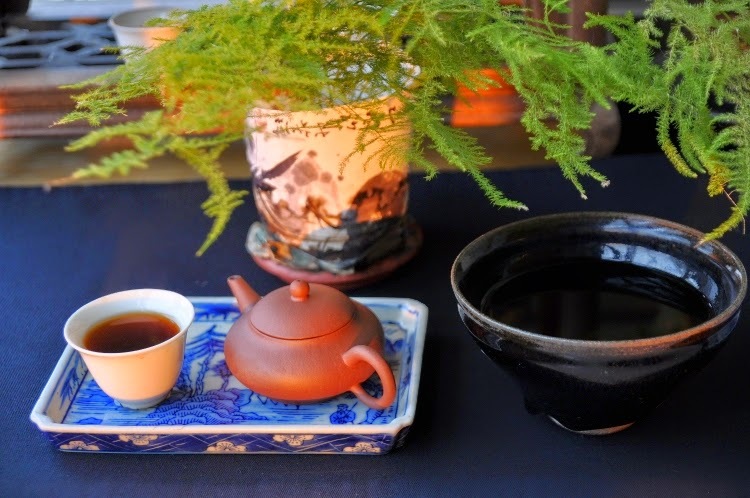 Et cela me montre aussi que la qualité originelle de ces glaises était telle qu'elles convenaient même au thé vert, plus fin et léger que du Oolong. Un ami lecteur habitant Taiwan, et bien connecté avec le Japon, voulut tester cette zisha, et la comparer avec sa théière japonaise, en glaise rouge, originaire de l'Ile de Sado. Son but est de trouver une très bonne théière pour infuser les Hung Shui Oolongs. C'est un style de thé qu'il apprécie tout particulièrement en cette période fraiche, et il a bien raison! 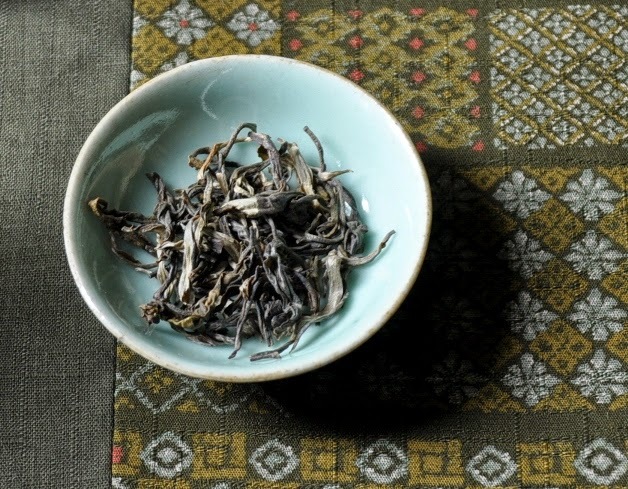 J'organise donc une dégustation comparative avec un très bon specimen: le Hung Shui Oolong de Yong Lung (Dong Ding) du printemps 2014. 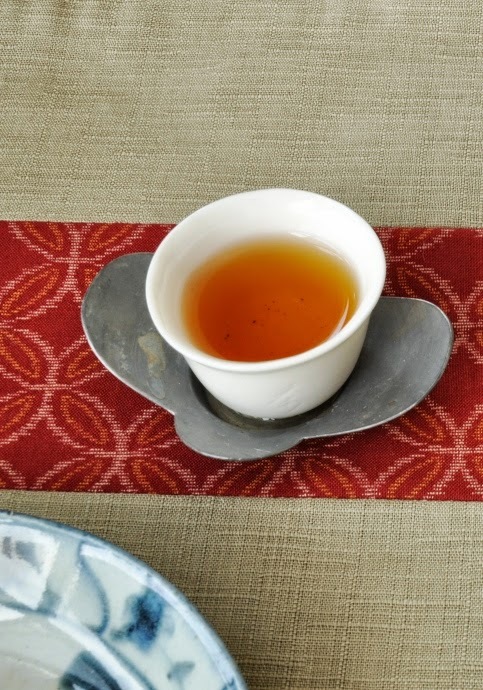 Je l'infuse en gaiwan, en zisha d'Yixing et dans sa théière Japonaise en glaise rouge. Pour l'instant, c'est cette théière qu'il consacre à ces thés, et il est déjà satisfait du résultat. La dégustation du même thé infusé en parallèle fut très instructive. Le goût de la glaise rouge apportait une note un peu sèche et astringente que je ne retrouvais pas dans l'infusion en gaiwan. Mais c'est en passant à la Ju Lun Zhu que la différence fut la plus évidente. Les arômes étaient surtout présents au milieu de la bouche et de la langue avec la glaise de Sado. Avec celle d'Yixing, la zone de sensations s'étendit dans tout le palais. C'était un peu comme quand on passe d'un écran 4:3 à du 16:9. Ou pour prendre une analagie musicale, le son n'est plus unidirectionnel, mais il prend de l'ampleur en résonnant de tous les côtés. De plus, ce goût avait plus de finesse et de moelleux. Le prix d'une théière ancienne est naturellement bien supérieur à celui d'une théière moderne. Mais, dans le cas de ces théières Yixing de collection, la différence n'est pas due qu'à l'âge ou à la forme. C'est aussi du à la qualité de la glaise employée. Je ne fus pas le seul à remarquer la différence: mon ami lecteur décida de s'acheter cette Yixing à l'issu de ce test! 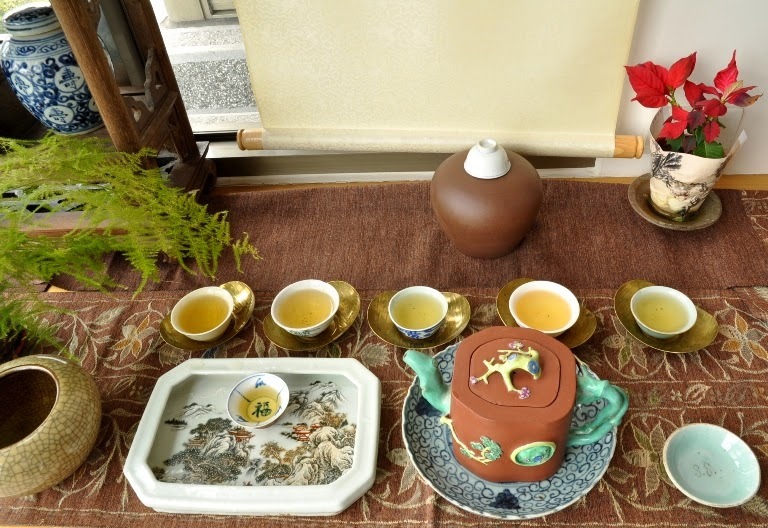 Note: Puisque je parle de thé vert, je vous signale la disponibilité des premières feuilles de ce printemps: mon Biluochun de San Hsia (à base de Jinxuan). Ce fermier me signale d'ailleurs qu'il a trouvé un nouveau débouché pour ses thés verts, le Japon! Hurray, it's spring! Temperatures are climbing fast as the sun rises earlier every day. Today, I drove to nearby San Hsia in order to check on the newest spring harvests. While on the way, I heard the news on the radio that Taiwan's water shortage is very severe this year. Despite some recent rain, the precipitation level since fall is at an historic low. A farmer I called in Central Taiwan yesterday told me same thing: his harvests in Zhushan are delayed to end of March or maybe even early April, depending on the actual growth of the leaves. So, while last year's delay was caused by the cold, this year, it's due to water shortage. 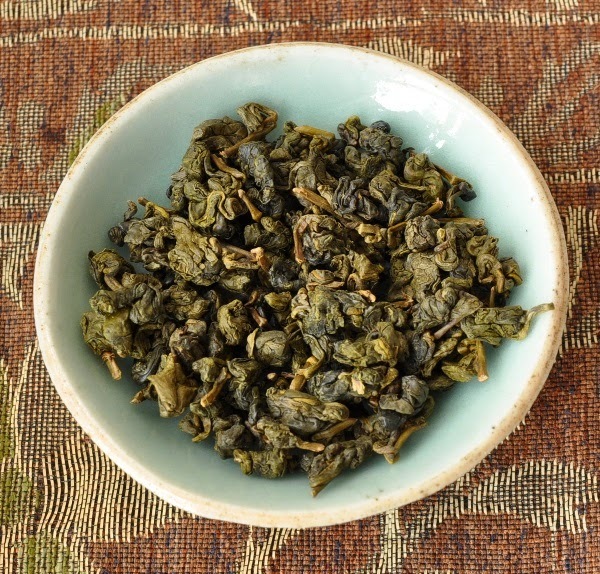 This 'Jinxuan' based Bi Luo Chun has a very raw, 'green' aroma. 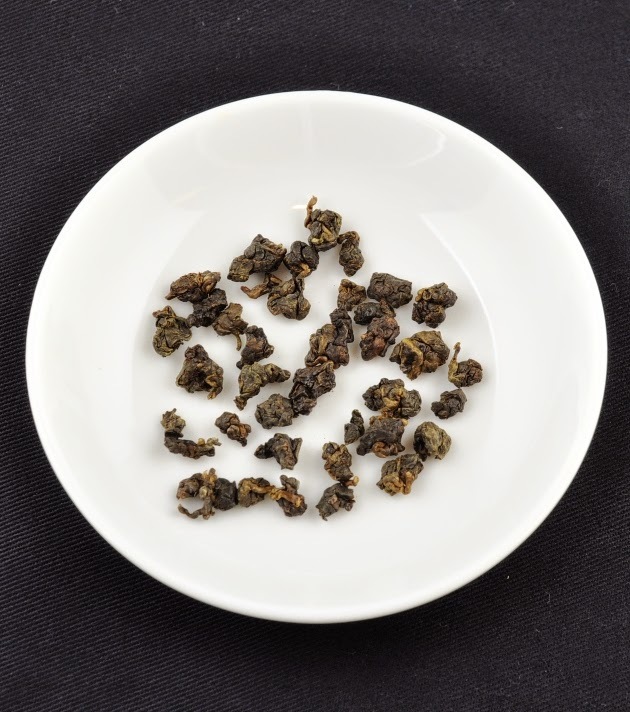 There's a noticeable difference compared to a lightly oxidized Jinxuan Oolong. It feels more authentic and close to its pure and original taste. 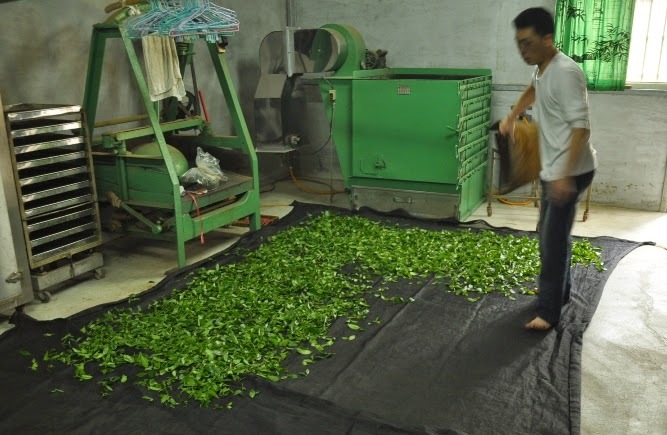 Harvested by hand on March 10th, it also has the softness and finesse I like in Jinxuan. 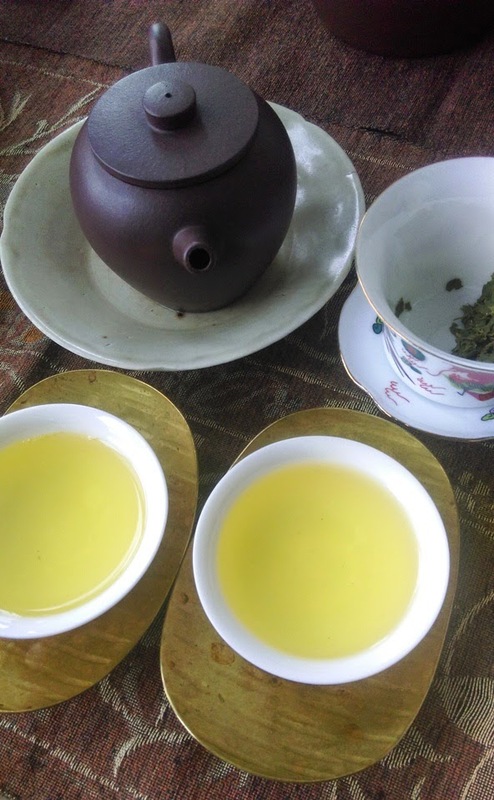 It will be interesting to compare it to my December 28th Jinxuan Dong Pian Oolong, the least oxidized Jinxuan Oolong there is, in order to taste the impact of this little oxidation. Today, the temperature climbed to 30 degrees Celcius (86 degrees Fahrenheit) on the plantation. 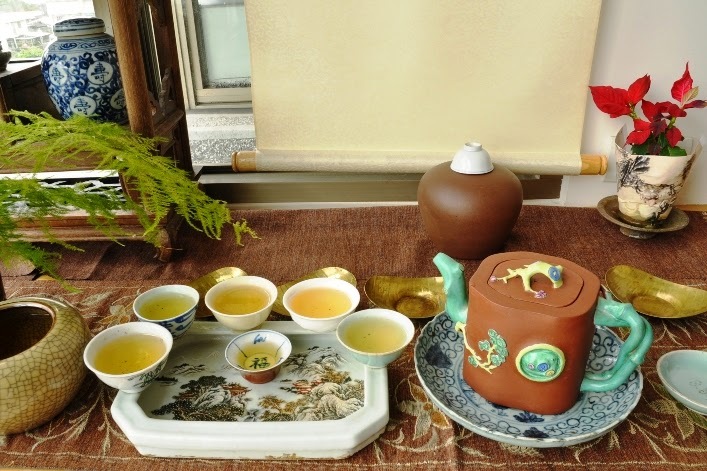 I had prepared the perfect thirst quencher: some spring 2014 Bi Luo Chun. These leaves still taste very light and sweet. As you can see, my Chaxi is a simple as possible and yet perfect for green tea. 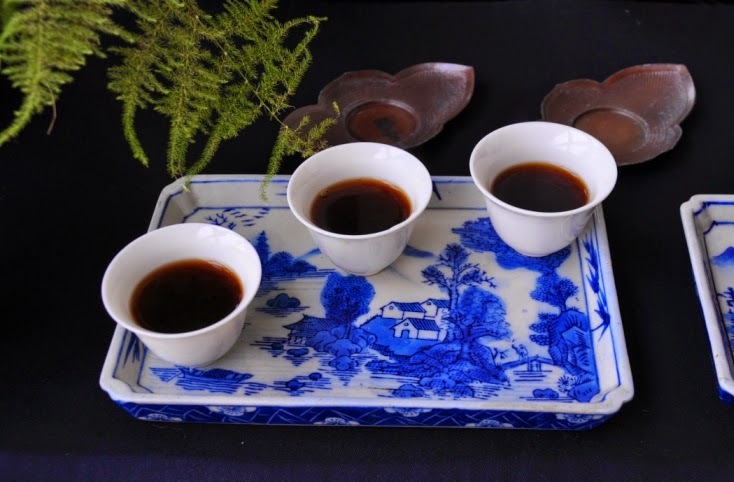 A black glazed Jianyang bowl serves as brewing and drinking vessel! 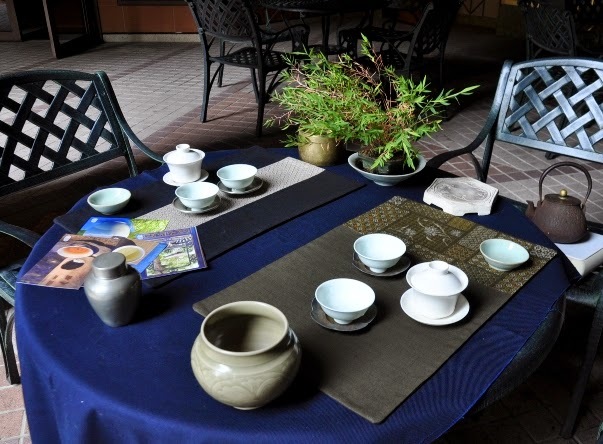 And thanks to the bamboo mat, the bowl could easily find its balance among the tea leaves! 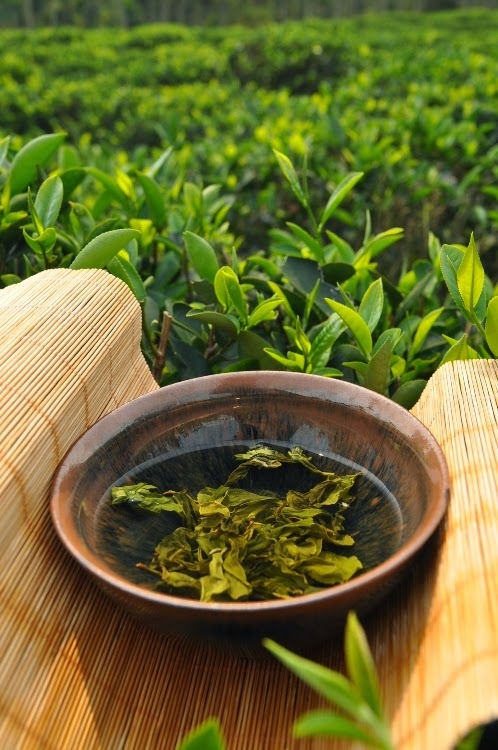 The brewing principle of green tea is to use very few leaves, much less than for Oolong. The goal is to obtain lightness, freshness and purity. Lively and soft water is the other key success factor you need to pay attention to. Then, with a black bowl, you are rewarded by the wonderful colors of the leaves finding back their original shape! Beauty in a bowl of spring tea! Avertissement aux âmes sensibles: thé rare et porcelaine fragile! 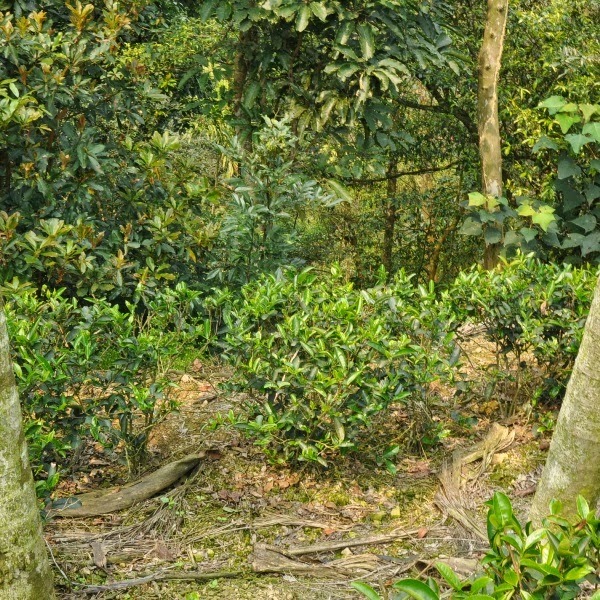 Ces feuilles sont du Shui Xian de WuYi, un vrai Yan Cha. 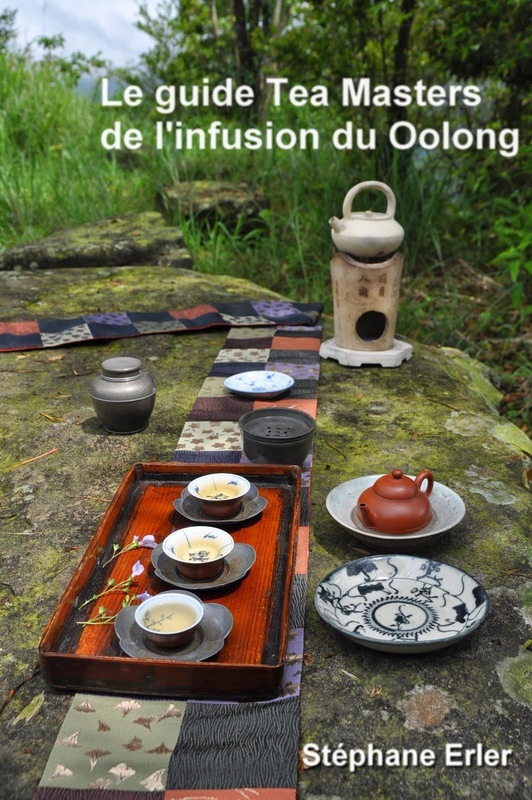 Disons-le tout de suite, le Yan Cha est ce qui se fait de meilleur dans la famille des Oolongs. Je le dis avec d'autant plus d'assurance que je n'en vends pratiquement pas dans ma boutique. La raison est double et logique: il est très, très cher et aussi très rare. Son prix est se compte en multiples de 3, 5 voire 10 de celui du Da Yu Ling! Bref, il faut être un peu toqué ou blindé aux as pour en acheter. N'appartenant pas à cette seconde catégorie, je préfère l'euphémisme de passionné! D'un autre côté, je sais être très économe avec mes Yan Cha. J'en bois (trop) rarement. Souvent, il me suffit de sentir l'odeur des feuilles dans leur jarre en porcelaine pour me donner ces super sensations d'une nature minérale, fleurie et ensoleillée. Je les garde pour les grandes occasions, quand j'ai du temps devant moi et des bons accessoires pour les réussir. 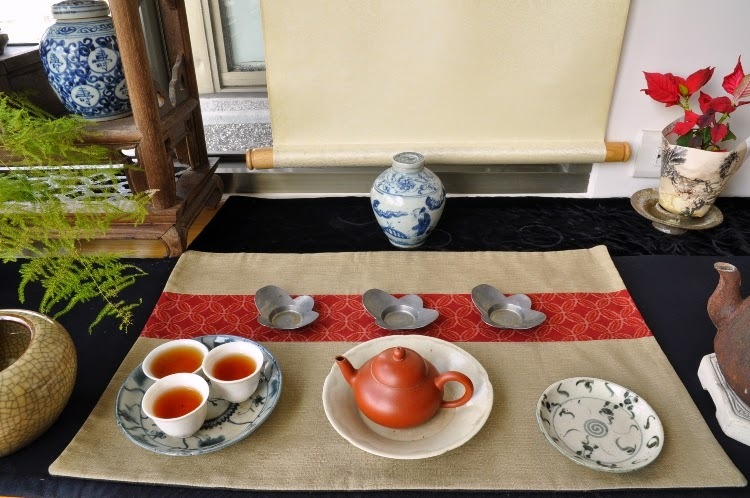 Mon autre excuse raison est de m'éduquer mon palais: savoir à quoi ressemble la perfection pour mieux savoir comment reconnaitre et sélectionner de bons Hung Shui Oolongs. Ceux-ci n'ont pas les mêmes odeurs de terroir et de cultivar, mais ils partagent cet équilibre entre la fraicheur des arômes originels et le feu de la torréaction. Il ne suffit pas d'avoir des feuilles excellentes. Si j'ai appris quelque chose pendant ces 12 dernières années sur la voie du thé, c'est que le théière, bouilloire et coupes ne sont pas accessoires! Ma théière est en zhuni d'Yixing et date des années 1980. Sa forme est petite, simple, tout en rondeur. Elle ne paie pas de mine et ressemble à des milliers d'autres si on la regarde de loin. Mais sa terre zhuni est particulièrement pure et dure. Ses infusions sont nettes et puissantes, mais avec une profondeur qu'on ne trouve même pas dans celles en argent. Elle fait des merveilles avec le Yan Cha! Quant à la tetsubin, j'en ai testé des dizaines avant de m'arrêter sur celle-ci. Elle n'a pas de pédigré particulier, pas de sceau personnel, pas de décoration ou d'incrustation en or. Elle a juste deux fins traits en argent sur son anse, du côté droit. Celui qui manie la tetsubin ne les voit pas (s'il est droitier). Mais ses invités les voient: avec elle, la beauté est donc un cadeau qu'on fait à ceux qu'on invite boire du thé! La beauté, on la retrouve partout sur ce Chaxi. Cela commence par les tissus et l'utilisation de petites assiettes anciennes pour les feuilles, la théière et les coupes. Mais revenons à ce dernier objet en porcelaine, essentiel et personnel. Il contient l'infusion, on le tient dans sa main pour le porter à sa bouche. Quoi de plus intime que la coupe qu'on pose sur ses lèvres! 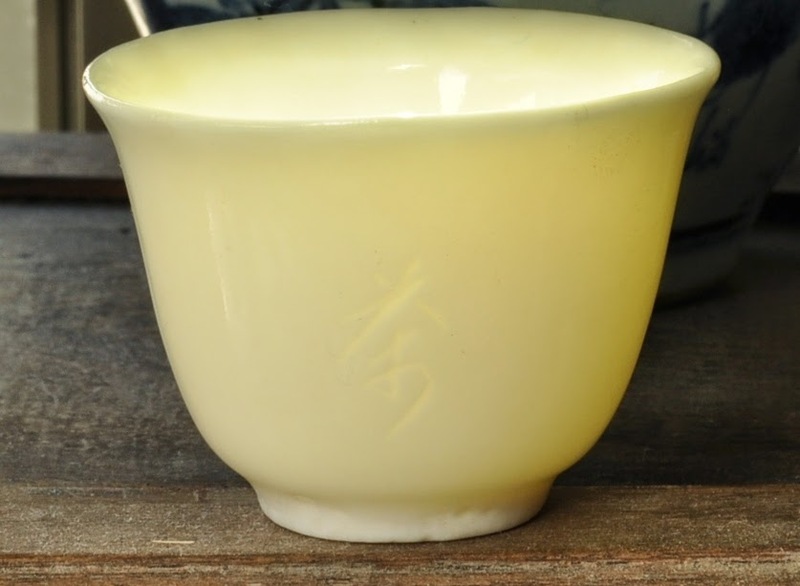 C'est une coupe en porcelaine du four de DeHua, dans le Fujian. Sa particularité est qu'elle fut faite à la main avec cette porcelaine couleur ivoire et qu'on y a inscrit la calligraphie 'Cha' de manière très subtile et élégante. Et, si je l'ai mise devant ma jarre de la dynastie Ming, c'est car cette coupe provient de cette même époque (fin Ming/début Qing)! J'avais pu goûter à ses propriétés il y a 10 ans environ, et cherchais à en acquérir depuis. Je m'étais presque résigné à ne jamais en avoir quand l'occasion se présenta, il y a quelques mois, d'en acquérir deux. Sur l'une d'entre elles, sur l'autre côté de la paroi, on devine un autre caractère, celui de l'alcool! Le sens est clair: dans ces coupes, le thé devient du vin! Le dessous des coupes n'est pas émaillé. On peut y toucher la porcelaine brute. J'adore leur douceur, leur petite taille. Elles ont des petits défauts, ne sont pas rondes, mais un peu ovales, l'une est plus fine que l'autre... Et surtout, elles sont si douces au contact des lèvres! Le bon Yan Cha y est encore meilleur! (Et non, je n'en ai pas d'autres à vendre! Par contre, je recommande mes coupes aux 2 dragons et perle. Elles viennent aussi de Dehua, mais sont plus récentes et mon alternative à ces coupes anciennes). 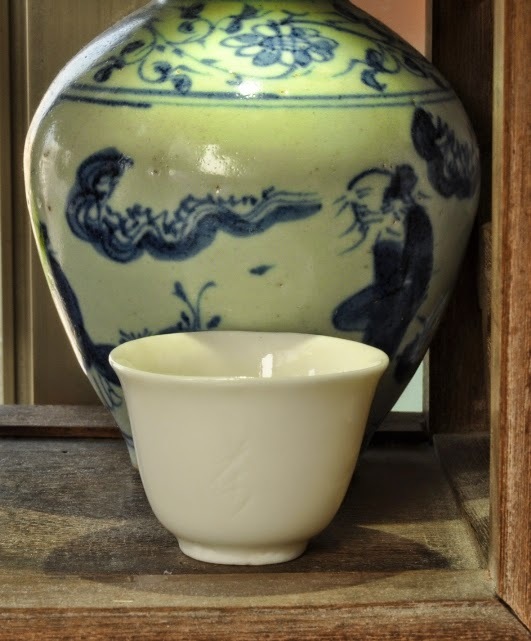 C'est en plein soleil qu'on apprécie mieux la douceur et la couleur lactée de la porcelaine de Dehua. On est loin de la froideur des porcelaines modernes! Ici, c'est le dos d'une autre pièce majeure, contemporaine de ces coupes, qui a rejointe ma collection. Ces coupes sont un vieux rêve qui se réalise. Un rêve de pureté et de perfection. 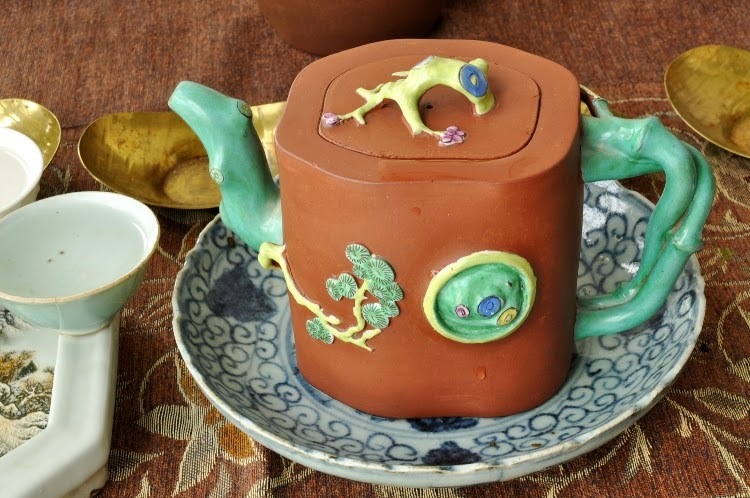 Il forme un tout avec le Yan Cha, la zhuni et la tetsubin. Mais l'aventure ne s'arrête pas là. A l'image de cette autre porcelaine de Dehua, il y a toujours de nouvelles découvertes! Mais, plus important, et cela nous concerne tous, on ne finit jamais de pouvoir améliorer sa technique d'infusion. Même avec les meilleurs instruments, certaines infusions sont meilleures que d'autres. L'essentiel, finalement, ce ne sont pas les accessoires, mais bien notre connaissance, notre amour du thé qui se traduit en gestes justes! The tea blogging world is rather small when you consider how many tea drinkers (or even shops) there are around in the Western world. So, it was with real pleasure that I met William from the Bannablog. We had exchanged teas in the past and now he's in Taiwan for half a year for his studies. And what he studies is very interesting, since it's agriculture and his objective is to become a tea farmer. So, our meeting became a two-way exchange of experiences and teas. 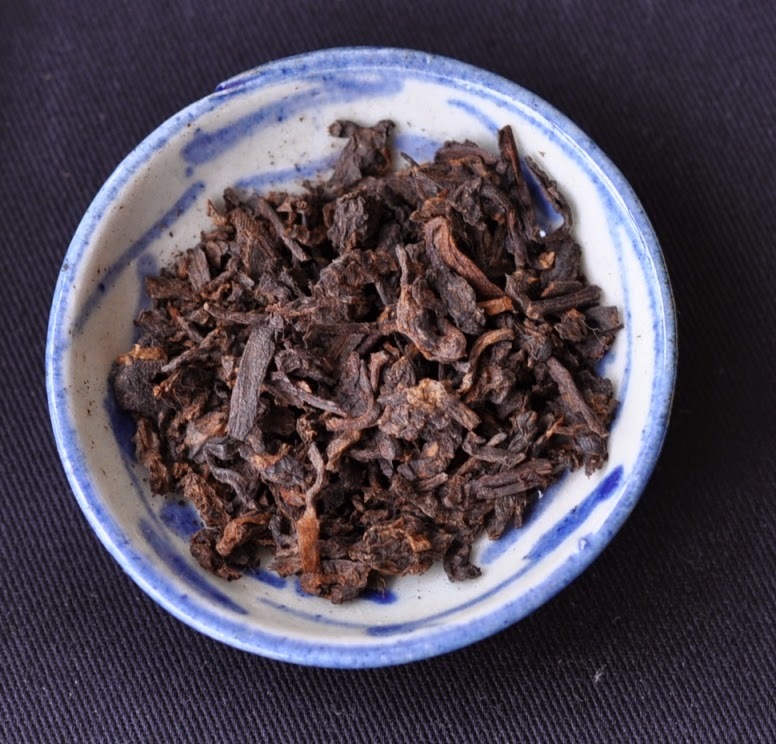 We started with this puerh maocha from northern Thailand. It's a tea that William has processed using leaves from an abandoned plantation! Exciting stuff! We brewed it in parallel with very different techniques. I used much fewer leaves than William and a longer brewing time. His brew had more flavors and energy. My goal was to test these leaves by subjecting them to a competition mode brew. The result was something powerful, with lots of aftertaste and fresh scents. It was a little rough and smoky, because it's a summer harvest and the tools he had at his disposal were very basic, but it's clean, natural and has lots of potential. And the taste is sweet, fresh, flowery with a refined aftertaste. (Here again, we used a simple long brewing with few leaves method). 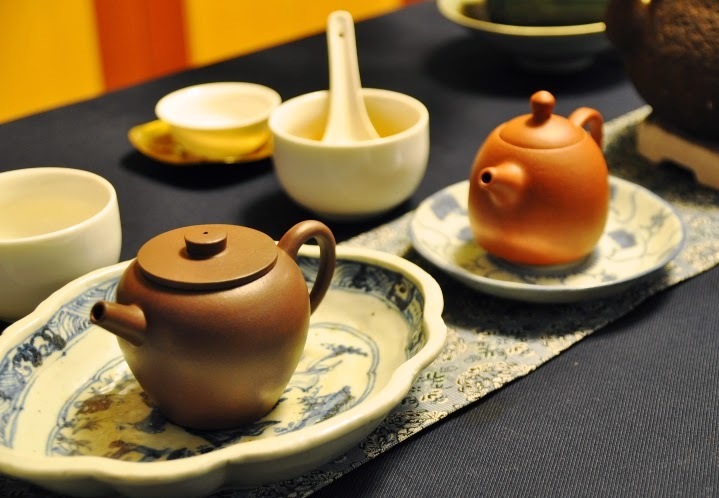 That's where great teas are excellent tools to learn about what quality tastes like! 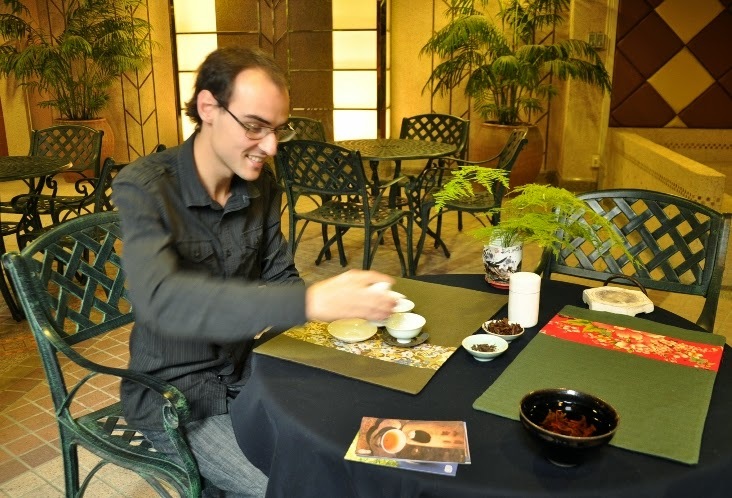 And I was glad I could share these teas and this experience with this fellow tea blogger! Récolté à la main en hiver 2007. Process: Peu oxydé et torréfaction moyenne/forte en 2007. J'en avais parlé dans cet article. Il s'agissait de la version 'strong roast'. A l'époque, j'avais trouvé cette torréfaction un peu trop forte et avais mis ce thé de côté, le temps que ses arômes s'assagissent. Et puis, je finis par l'oublier au fond d'une armoire! Les tasses jouent aux acrobates pour ne pas cacher la jolie peinture de leur support: Inspiration du cirque nouveau! L'aspect de ces feuilles montre que son vieillissement lui a donné une couleur plus claire et disparate. L'impact foncé de la torréfaction s'est progressivement dissipé. 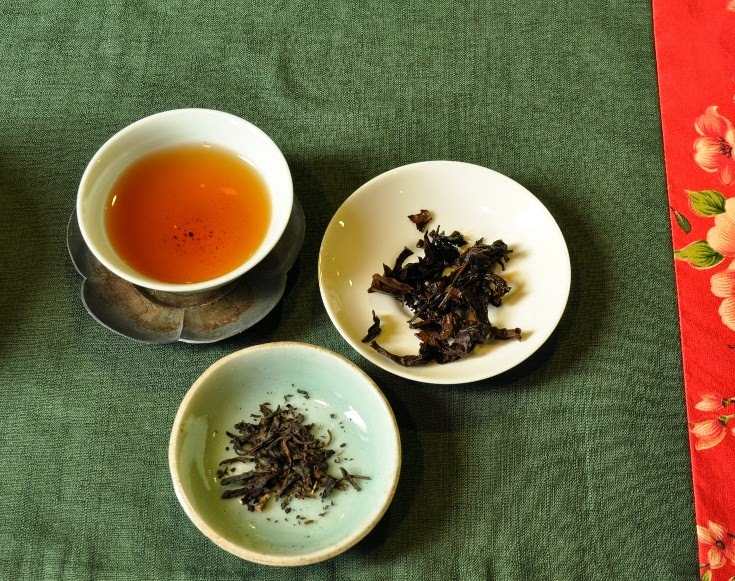 Les feuilles redeviennent de nouveau vertes, mais avec une teinte moins fraiche et brillante que pour un jeune Oolong. 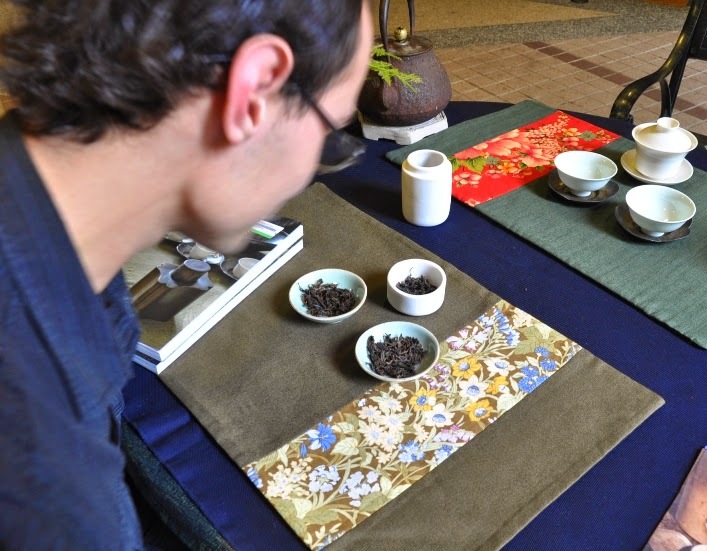 La seconde remarque qu'on peut faire sur ces feuilles est que leur roulage est moins serré qu'un Oolong récent. C'est un signe de vieillissement. 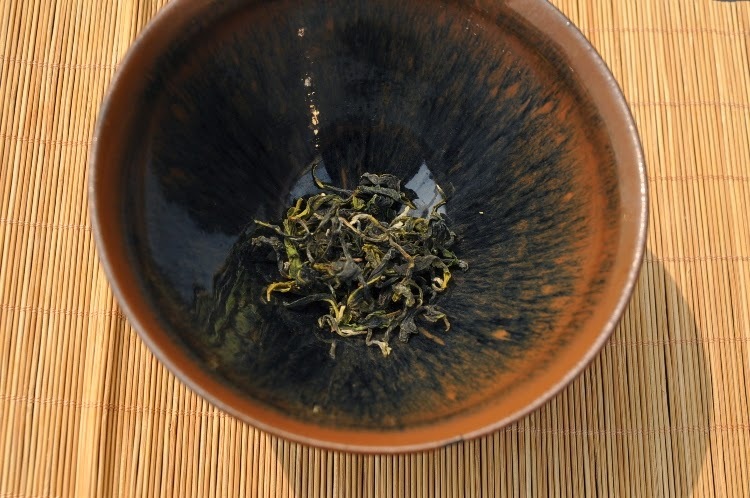 Les odeurs sont sombres et maltées, mais avec plus de douceur et d'harmonie que pour un Hung Shui Oolong nouvellement torréfié. Quelques odeurs de vieux commencent à apparaitre à sec, mais c'est encore discret. Ce compte-rendu de dégustation varie un peu de celui de ma boutique, car j'utilise ici cette ancienne théière d'Yixing en zini et décorée par des émaux de couleurs. On y voit une évocation d'un tronc d'arbre, une poignée de bambou, une branche de pin sur le corps de la théière et une branche de prunus en fleurs sur le couvercle. 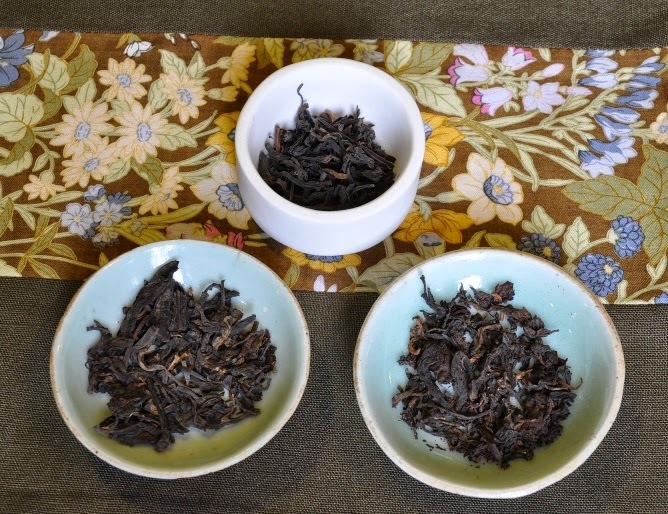 Pendant plusieurs semaines, j'avais d'abord infusé mes puerhs anciens dans cette théière, car je consacre déjà mes 2 autres Yixing anciennes aux Oolongs torréfiés. Cependant, j'ai fini par remarquer que ce mariage arrangé ne produisait pas les résultats espérés. 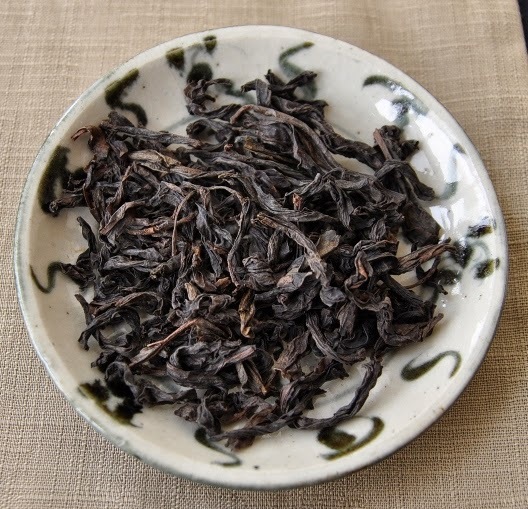 L'odeur du puerh ne se mariait pas bien à cette glaise. Aussi, j'ai récemment décidé d'y infuser les Hung Shui Oolongs, avec bien plus de succès. Les théières ont bien des affinités électives avec certains thés, et j'étais présomptueux de vouloir lui imposer du puerh! La conservation sous vide a préservé la fraicheur et la force des arômes. Ce thé ne semble avoir rien perdu, mais juste gagné en harmonie. Il semble avoir encore beaucoup de potentiel pour continuer à évoluer positivement avec le temps. Si on veut un changement plus profond et rapide, la conservation en jarre en porcelaine est une meilleure solution selon ce ce test. En tous cas, ce thé permet d'en savoir plus comment le Hung Shui Oolong évolue sous vide après plus de 7 ans de stockage sans nouvelle torréfaction.